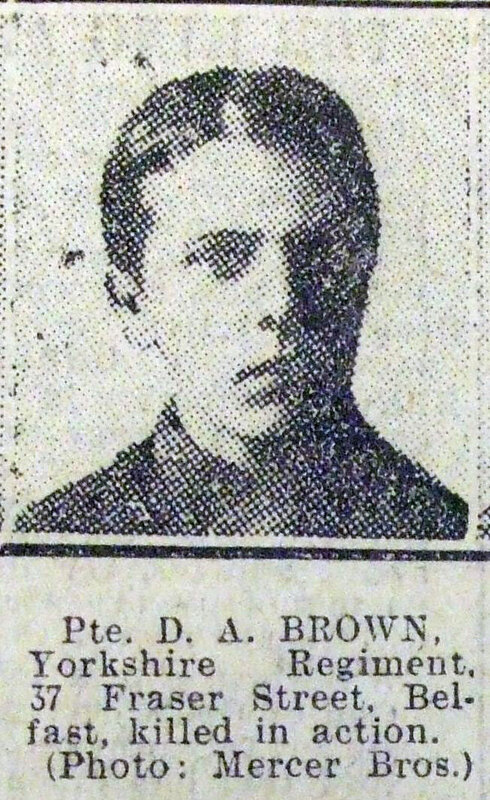 Private David Alexander BROWN, 30004. 9th Battalion Yorkshire Regiment. Formerly 32797, the Notts and Derby Regiment. Son of John Brown, of 37, Fraser St., Newtownards Rd., Belfast. Born at Newry, Co. Down. Killed 10 October 1918. Aged 21. Born Newry (co. Down), Enlisted Belfast. The attached photo is from the Belfast Evening Telegraph, and has been provided by Nigel Henderson whose website, Great War Belfast Newspapers, contains lists of articles and pictures that have been gleaned from Belfast newspapers from the Great War period.